From 18th-century political revolutionaries to the first dudes to skateboard down a half-pipe, Americans have risked life and limb in pursuit of greater glory. We are, by many rankings, among the most entrepreneurial people in the world. We place big bets and reap large rewards—or large losses. We also explore the deep seas and outer space. Not to mention that we'll go over Niagara Falls in barrels or walk across the Grand Canyon on a tightrope just to make news. Even our popular music—from jazz to freestyle rap—prizes improvisation and daring. Do Americans really possess a propensity for risk—and if so, what explains it, and how does it differ from that of other nations? 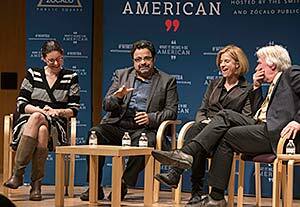 GRAMMY Award-winning jazz pianist Arturo O’Farrill, Adventure Divas host Holly Morris, and Megan McArdle, author of The Up Side of Down: Why Failing Well Is the Key to Success, discuss risk and the American way. This event took place at the National Museum of American History in Washington, D.C., produced in collaboration with Zócalo Public Square as part of the What It Means to Be American series.